Gerry Conway, the creator and long-time writer of Firestorm, is returning to comics after almost 20 years away! Conway has been writing for television and film all these years and has recently become interested in comics again. 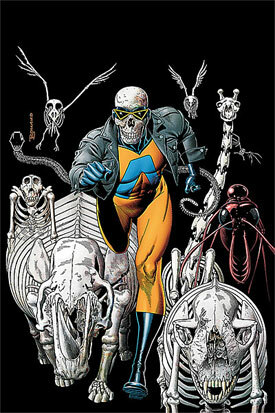 His first comic back in the biz will be The Last Days of Animal Man, a six-issue mini-series starting in May. First thought… it’s freakin’ awesome that Gerry Conway is coming back to comics! Hooray! In addition to writing Firestorm, he wrote TONS of comics in the 70’s and 80’s. He is responsible for many of the more memorable Satellite-era JLA stories and the death of Gwen Stacey in the Amazing Spider-Man. Second thought… it’s Animal Man! 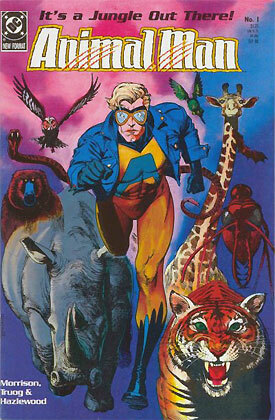 I love me some Animal Man! I’ve been a fan of Buddy’s for over 20 years. The Brian Bolland cover for The Last Days of Animal Man #1 (seen to the right) is a brilliant homage to another one of his own pieces, Animal Man #1 from 1988 (seen below on the right). This news actually broke a while back, but I’ve been waiting to see how it might relate to Firestorm before reporting it here. Newarama ran a great interview with Gerry Conway on Friday that provided me with the information I’ve been waiting for. To read the entire interview, click here. So I went to this convention, and I ran into Geoff Johns, whom I’d never met. And he and I talked a bit, and he was apparently a fan of my stuff, which is always very flattering. So I started looking at what he was doing. I was curious about his writing and what was being done in comics in general. Geoff Johns + Gerry Conway = A possible return of Gerry Conway to the Ronnie Raymond/Firestorm character? NEWSARAMA: You’ve mentioned Ronnie Raymond more than once in this interview. Is there any chance we can get you to bring back Ronnie for your fans? GERRY CONWAY: I’d be willing! But it’s not up to me. The powers that be have their own plan for that character, although I’m always happy to see what they’re doing. I’ve been very tickled by the fact that so many of my characters have come back in the last few years in big ways. My hopes of a Gerry Conway Firestorm was dashed against the rocks. However, he did state that TPTB have their own plan for Ronnie. That’s encouraging! And who knows, maybe if Conway’s Animal Man mini-series is received well, he’ll do more comic book work eventually leading to him tackling Firestorm again. Hey c’mon… a boy can dream. Posted in: Comic books, Gerry Conway, News. I wish Conway had written the Vixen mini-series, as well. I miss that character, as few have gotten her halfway right since her creator left comics. I didn’t read the recent Vixen mini-series. Any good?